The MTV Movie Awards is an annual film awards ceremony designed to recognize and reward the best actors and actresses in a myriad of categories such as Best Kiss, Best Villain, and Best Breakthrough Performance. The award ceremony is organized by the MTV Network. The first MTV Movie Awards were held in 1992. MTV Producers and executives produce a list of nominees that is available for the general public. The general public then selects their favorite actors from this list and this determines the winners for each category. The 2018 MTV Movie & TV Awards will be held in Los Angeles. It will be hosted by Tiffany Haddish. Dwayne Johnson and Kevin Hart hosted the 2016 Awards from the Warner Brothers Studios in Burbank, California. They are recorded on the Saturday before and broadcast on MTV the Sunday date given here. The MTV awards have novel categories such as Best Sandwich, Best Movie Spoof and Best Gut-Wrenching Performance. Jim Carrey, Robert Pattinson, Mike Myers and Kristen Stewart are the biggest winners in MTV Movie Award History with 11, 10, 7, and 7 awards respectively. Mike Myers has hosted the MTV Movie Awards 3 times since 1992. I’ve just killed my chances of ever winning an Oscar . - Jim Carrey, after winning for Best Comedic Performance and Best Kiss, both in Dumb and Dumber. 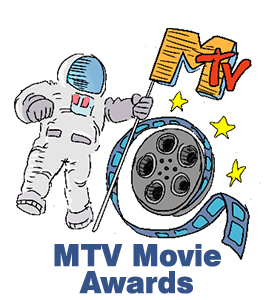 Tune in to watch the MTV Awards which are broadcast live on MTV to see if your favorite actors have received the award. Vote for your favorite actors online on MTV's website to support them. Watch one of the Best Movies as decided by MTV. Past winners include The Twilight Saga , The Lord of the Rings Series , Wedding Crashers and Titanic . Host an MTV Award party. Have a competition to see who can make the best popcorn statue and award a prize to the winner.